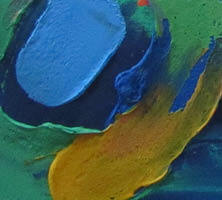 My modern abstract paintings have a story and a name, because what I feel I express with my contemporary abstract art. I want the viewer to know why I paint too, so I provide a brief description. I think it’s important to have a short story and a name for each of my colorful textured wall hangings to make it complete. I find inspirational stories and names in nature. I paint about water, leaves, festivals, flowers, wind and storms. For instance if there are alot of splotches on the canvas I might mention rain or water, but I then I also like fun quirky stories and names like Dreaming Myself Awake shown above which is more about my state of mind and internal experiences. 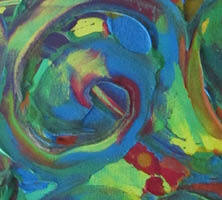 When I paint I also think about who might buy each abstract painted canvas. What the future owner of that original abstract painting would like and what their home decor style is. I’ve created paintings for one of my sisters that had plenty of greens, blues and purples, the abstracts fit in perfectly with her decor. 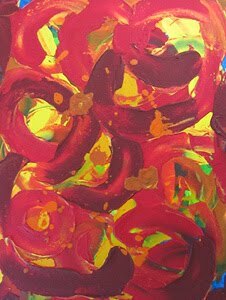 For another sister I paint artwork using primarily yellows and oranges which worked very well in her home. 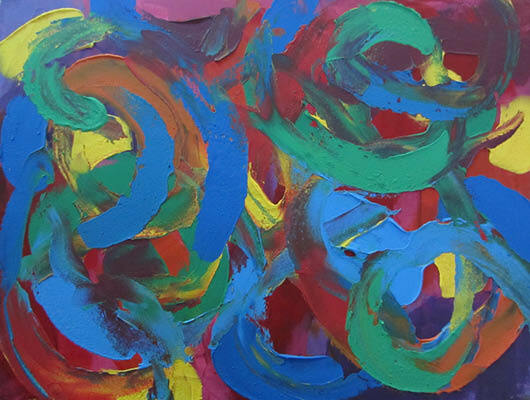 Abstract painting is an organic experience. While I might start a abstract painting with an idea in mind, I have no fixed plan and may switch direction part way through the painting process depending on what transpires before me on the canvas. 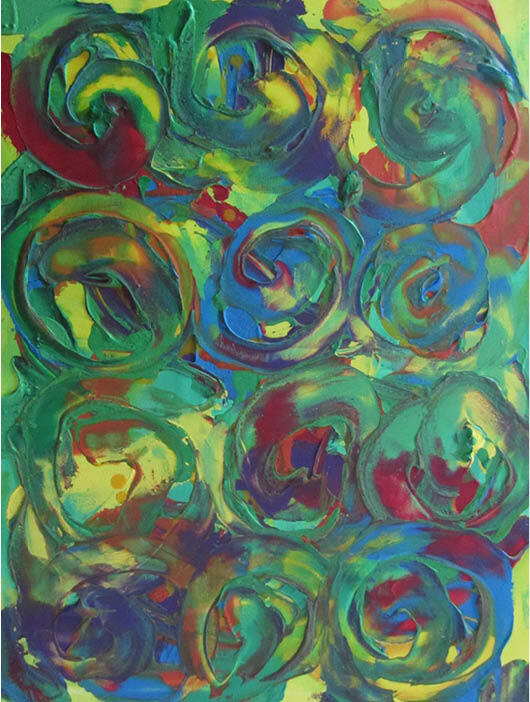 The abstract painting Dreaming Myself Awake shown above is a textured acrylic with bold thickly painted swirls in green with blue, red, orange, yellow and purple highlights. My strange colorful dreams mesmerize me, one rolling into another with odd details and fantastical moments that slowly wake me up. This original wall hanging measures 18" x 24". Painting colorful abstract art with my nieces is a fun and unique afternoon experience. They understand the concept of letting creativity happen spontaneously. I wasn't surprised they did so well at contemporary abstract painting, kids are naturals at staying in the moment. At first I wondered if they would understand what abstract painting is, but they easily painted colorful bold abstract interpretations of objects around them. They knew it was not about being realistic to the shape and form of the objects, but about capturing the feelings that objects could evoke when personalized. 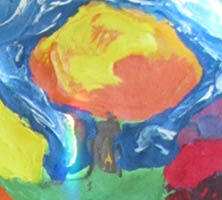 Expressing that on canvas with color, texture and brush stroke was childs play to them. What I learned about abstract art from my nieces is that I have to keep it fun, if I don’t my artwork visibly suffers. If I get stuck on one abstract painting, I put that canvas aside for awhile and keep going with another painting and then when I'm ready I come back to the original painting. Modern abstract painting is a great learning experience for all other things in life, if I’m not keeping it loose and going with the flow it shows. 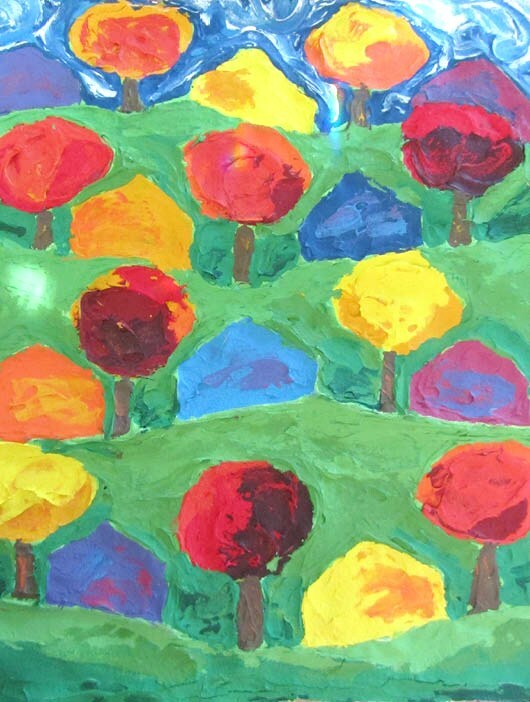 The abstract painting Pretty Houses in the Hills shown above is a textured acrylic with bold thickly applied paint in green and blue with red, orange, yellow and purple paint used for the houses and fall colored leaves. Here the enchanted rolling hills are filled with vibrant colors in the fall. This original wall hanging measures 16" x 20". 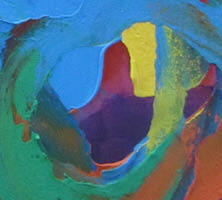 My original abstract paintings have a modern contemporary style. 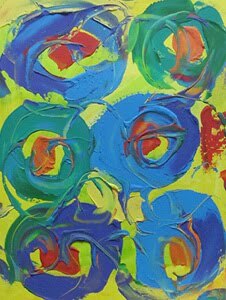 My abstracts are expressive in shape and color, they’re textured, bold, vibrant and happy. I like having a cheery abstract scene hanging over my breakfast table and a bold splash of color in my living room. I love a stylish bright lived in home with eclectic furniture pieces, comfy pillows and great lighting to show off the wonderful decor items I’ve collected over the years such as my pretty vases, pottery and glass. But nothing is more beautiful than a modern abstract painting to inspire you and bring everything in your room together. The colors and textures in the abstract art will pick up and draw out the colors of all the surrounding pieces creating a dynamic multi-layered space. Tip: you can update your home just by taking out a few decor pieces and changing them for other decorating items. There is no need to make a big project out of it. Then see what I mean by using a bold contemporary painting as a focal point to pull all the other elements together. View your space with the abstract painting and then without and you’ll see the difference immediately. 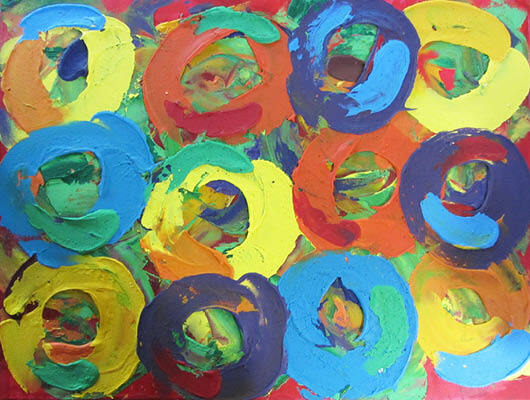 The abstract painting City Life shown above is a textured acrylic with connecting swirls and bold paint strokes of red, orange and yellow with touches of green and blue. The city is full of energy and always in motion, peoples lives intersect and converge constantly. This original wall hanging measures 18" x 24". As an abstract artist reinventing my abstract painting style is ongoing, I can’t be stagnant as an artist. If I don’t look at the colorful abstracts I painted last week I'm easily inspired to start a new original spatula or brush technique with my next set of contemporary modern paintings. 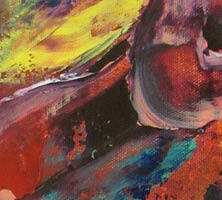 So how does one create a style as an abstract painter? For me it come from the subconscious influences of everyday. Everything around me influences my artwork and I think it’s great, because my paintings are an interpretation of those influences, never an exact duplicate. So my style changes, but it’s always me too. I paint impressions of what I’m thinking or seeing after it’s been turned over in my mind. My painting style has many influences and becomes richer for those influences. I can be out in nature and some of what I see shapes my future art without me even trying. 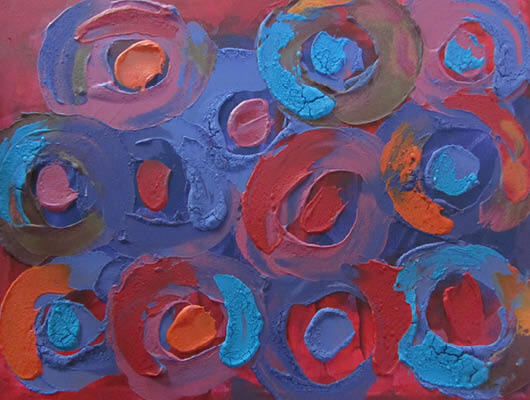 I am greatly influenced by bold colors and unique textures, these two elements are prevalent in all my original artwork. When I was younger my mom owned a garden center and I was always surrounded by brilliant colors and unusual textures. This was a big influence on me and all my sisters, even now we are all strongly connected to color. 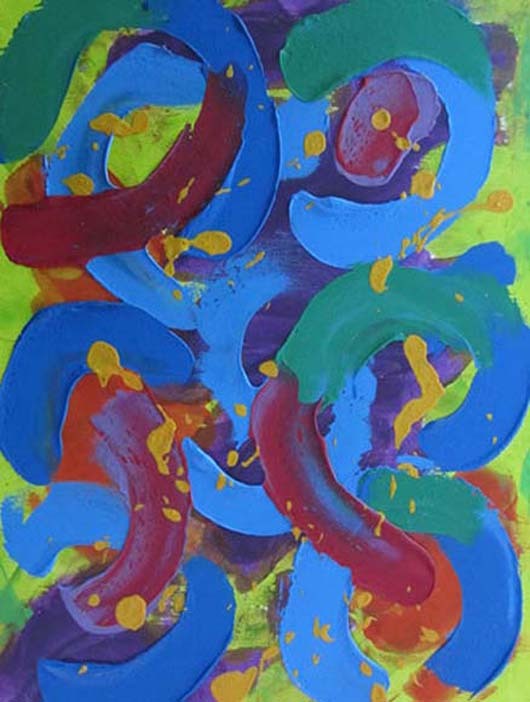 The abstract painting Yearning shown above is a textured acrylic with swirls of blue, green, red, orange and yellow with touches of dark purple. Yearnings swirl around and bubbles over inside, building the energy to make happen what you most desire. This original wall hanging measures 18" x 24". 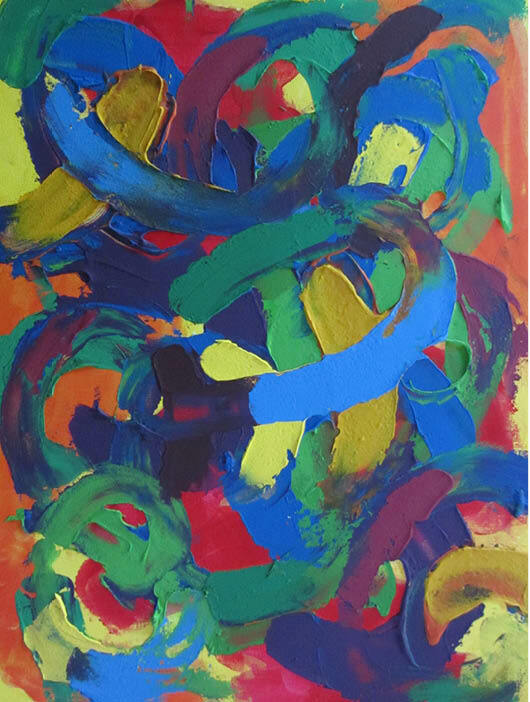 Bold fun abstract art is meant to hang in living rooms, family rooms, bedrooms and dining rooms, anywhere you share with family the ups and downs of each day. Create a home with a joyful atmosphere by placing bright wall hangings in every room to inspire a healthy sharing environment. I’ve always felt my home is my sanctuary. A place where I can retreat and rejuvenate with family and friends. I want my environment to inspire and enrich my life and the lives of my loved ones. 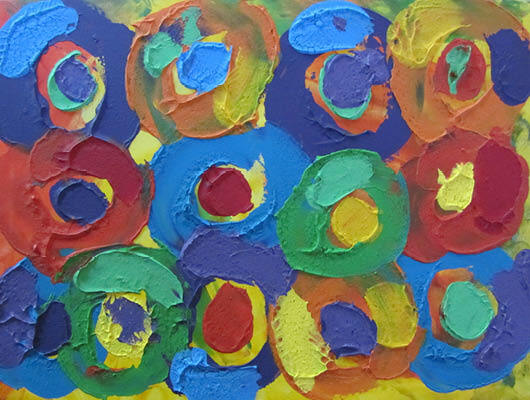 Having colorful textured abstract paintings brightens my life experiences with my family. No one’s family is happy all the time, there are many up and downs in live, but it’s important to do as much as possible to set the tone in the right direction. You want a calming yet cheery oasis to start and end your day with. Beautiful original abstract paintings and colorful tasteful decor will evoke the atmosphere you want for the happiness of your family and friends. So make bright choices for your hanging artwork and decor and be organized with your belongings to create that calming and cheery feeling in your home. 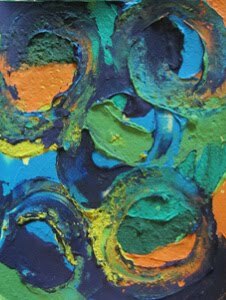 The abstract painting Christmas shown above is a textured acrylic with thick blue, green, red and orange paint over a yellow background. Christmas tree branches adorned with lights and many shiny decorations collected over the years. It’s the best time of year for my family. This original wall hanging measures 18" x 24". Abstract painting teaches me persistence. I love bold colorful abstract art so much that I keep working at it and I see my painting techniques improve naturally over several months. This teaches me to keep going in other areas of my life when things don’t always go so smoothly. Another lesson I take from my love of abstract painting which I’ve incorporated into the rest of my life is that you just can’t predict what another person may like. 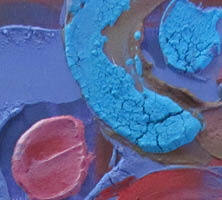 I love to show my textured abstract paintings to friends and family. During my art showings I see that my favorite modern abstracts are not always everyone else’s favorites. Their chosen paintings may be ones that I was not totally sure about. I think that's great, because from that I've learned not to judge my work too quickly and broaden my creative view. So now when it comes to other areas of my life I appreciate when friends and family choose differently from me. The abstract painting Blazing Sunset shown above is a textured acrylic with thick orange, yellow and red paint overlaid with blue and green brush strokes. The suns bold rays reach out across the sky and color the clouds in unusual colors, leaving the viewer in awe. This original wall hanging measures 18" x 24". Painting original abstract art is addictive. 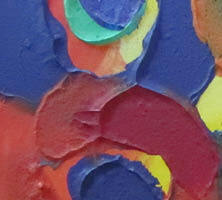 The more I experiment using bold thick textured paint to create colorful modern abstracts the more I want to paint. Something good always comes out of my time spent painting and I always have a beautiful piece of art at the end of the day. While painting I can start out stressed, but after an hour I’m in the right frame of mind. 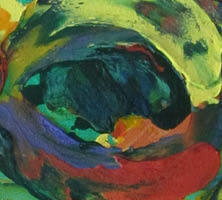 I can paint for several days and then I will put those finished abstracts away. Keeping my colorful modern paintings out of view for awhile help me in many ways. I can look at the paintings later with a fresh perspective and clearly see which canvases are finished and which need more work. I think everyone can benefit from doing something they really enjoy just for themselves. I didn’t think of painting as a career at first, just as a form of stress relief. The feeling I get from painting stays with me and I can leave my frustrations behind in my studio. 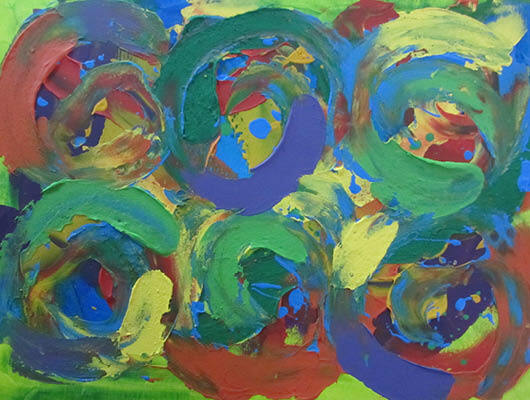 The abstract painting Spring Pushing Through Winter Ice shown above is a textured acrylic with thick blue and green paint with accents of yellow, red and orange. The winter snow melts, but there is still a thin layer of ice encasing the new spring growth. As the sun grows warmer the ice breaks leaving winter behind. This original wall hanging measures 18" x 24". 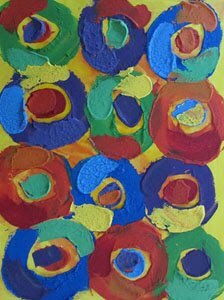 Hanging original abstract art paintings is a creative way to add bold color and fun texture to keep yourself focused, happy and centered at your work. Offices should be inspiring and comfortable, after all we are not machines and even the most dedicated worker needs to come up for air once in awhile. After too many hours sitting at your desk, on the phone and typing on your computer do you feel drained as you stare at dull white walls all day long. Inspire yourself by creating an area you can work in. Look for small abstract wall hangings that won’t take up too much space, but will provide a colorful textured focal point. Modern contemporary abstracts are great timeless pieces for any office. 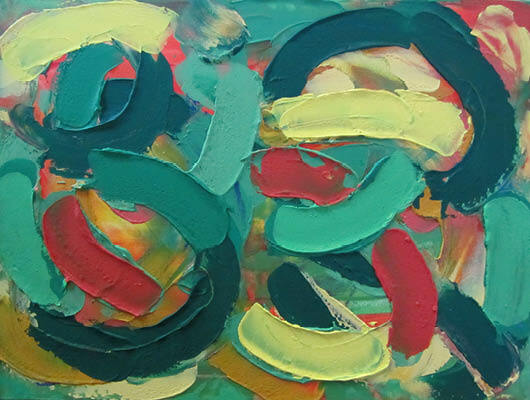 Contemporary abstracts set the mood with color and texture and depending on the abstract painting you chose the subject matter can be interpreted to each viewer’s liking. Have you noticed the places with the least amount of art, color and visual interest are offices and hospitals. They are the most removed from nature too. In these places we can feel more tension with the void of mood enhancing atmosphere, but this can changed with thoughtfully chosen decor and wall hangings. It’s easier to be happy if you have colorful paintings and decor items like bold contemporary abstracts around you that can boost your mood, inspire creativity and enhance your performance. Enjoy your surroundings so you can leave your work at the office. 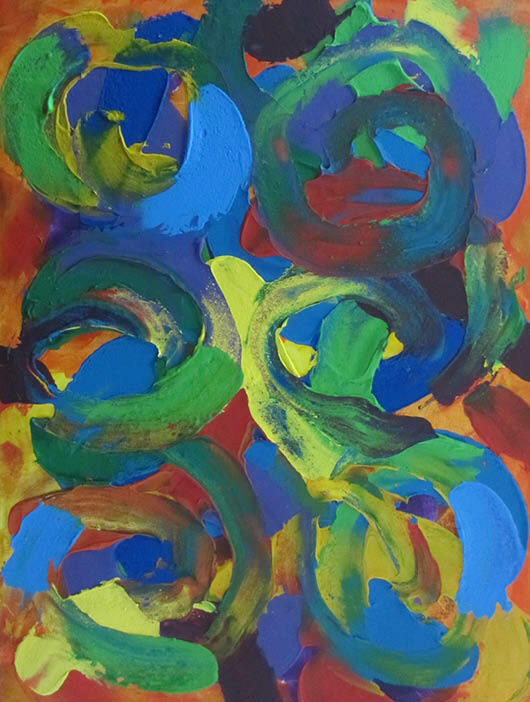 The abstract painting Carnival shown above is a textured acrylic with thick blue, green, yellow and red paint layered over bold orange. Carnival Dancers perform in elaborate costumes waving colorful ribbons to soul energizing music. The visual spectacle mesmerize the audience. This original wall hanging measures 18" x 24". 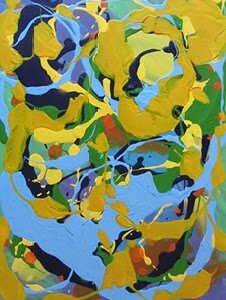 I love painting my modern abstracts using bold colors and broad brush strokes, but I’ve also acquired a new pleasure for using softer colors such as pastels and yellows in my abstract art. The soft colors are a great contrast to highlight my favorite bold paint colors of bright red, vivid blue, lush green and deep purple. 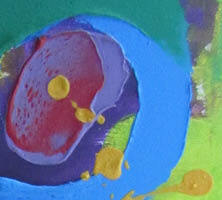 The more I experiment with color in abstract painting the more I discover new color combinations I like. I’ve also learned that bold happy colors can be sophisticated with the right combination of other colors in modern contemporary art and home decor. 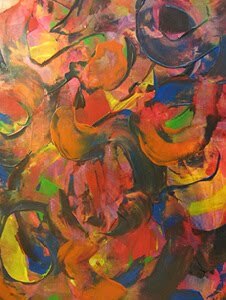 One of the many reasons I love using so much color in my abstract art is that color can project strong emotion and influence how I feel. Blue is calming, red has energy and passion while yellow feels sunny and happy. 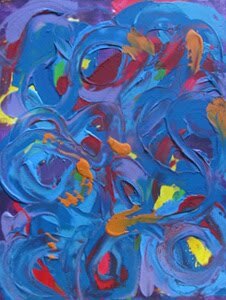 I choose to use many of these colors together in each one of my abstract paintings making a blend of happy passion, serenity and bliss. 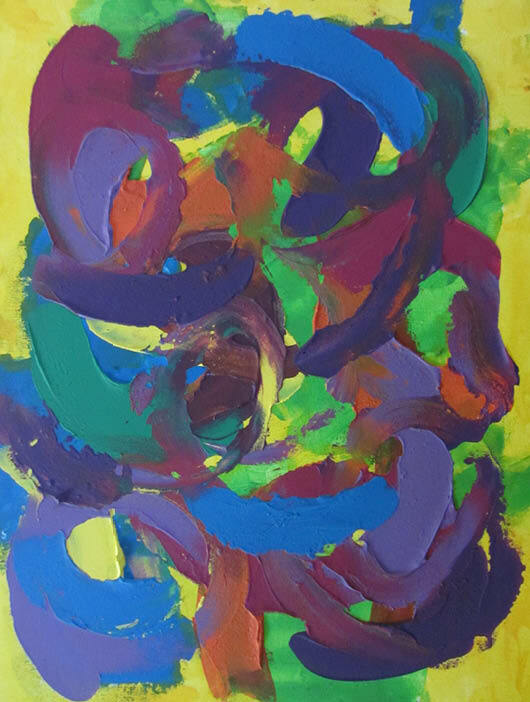 The abstract painting Paradise is a Cool Breeze shown above is a textured acrylic with thick blue, purple, green and orange paint layered over softer yellow undertones. Sunlight filters through lush tree leaves as a cool breeze off the water eases a smiling daydreamer to sleep. This original wall hanging measures 18" x 24". When I paint original abstract art I am inspired by creating something out of nothing, so I really don’t need to start with an ideas before painting on canvas. 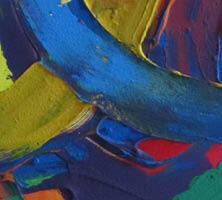 In the process of abstract painting I get inspiration from colour and from layering texture on canvas. When creating contemporary abstract paintings I think of what I love: nature, wild flowers, waterfalls, falling leaves, sunsets, wind and storms. Then there is the visual beauty created by colourful street festivals, boats on the water and streets with bold coloured houses in a row. 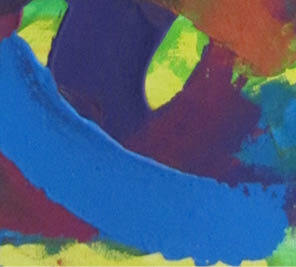 So often when I paint my bold modern abstracts I look out the window, or I think of travelling to exotic places. Next the movement of my spatula when it hits the canvas feels so natural to me that I am inspired to paint because of the peace of mind it brings me no matter how I’m feeling before I start. With a spatula I create texture with thicken paint colours layered on top of each other, so pops of colour will show through from underneath. In my abstract paintings the bold colours blend together in organic shapes and each new layer adds a depth of texture with shadow and light and I begin to see the image I am creating. 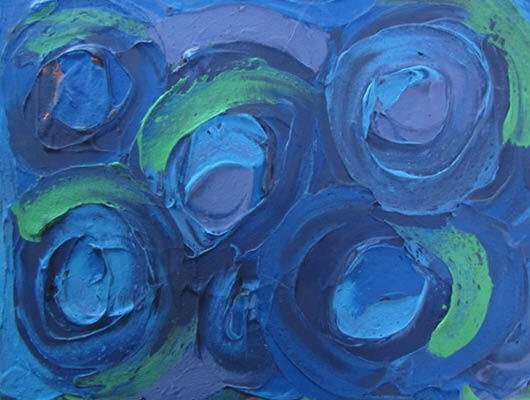 Skipping Stones shown above is an abstract painting in textured acrylic. 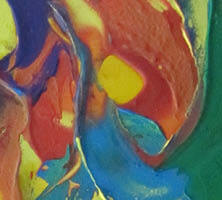 Colours of yellow, orange and red represent sunlight reflected on blue green rippling water. This original wall hanging measures 18" x 24". Young friends pass an afternoon skipping stones, creating a dramatic rainbow of colours on the water’s surface. Rotate art, paintings and decor items to new areas in your home to revive your space. Your collection of abstract art and contemporary paintings can work wonders when swapped with other art, wall hangings and decor items. It’s a nice surprise to see your modern abstracts in a new setting. Shops move merchandise around in their stores all the time to make it look new and exciting. That works for paintings and art you’ve collected over the years too. When you see your favorite painting in a totally new light, the textures of the brush stokes and the contrast of light and bold colours in the painting will catch your eye, you’ll notice how much more you enjoy your space again. You can rotate wall hangings and paintings between friends’ houses, I have several sisters who rotate art. Or you can rotate art to your office, people now expect to see art at corporate offices and contemporary art works very well in office spaces. Moving your well loved works of art is a fun afternoon adventure and costs you nothing since you already own the paintings. It may save you from an expensive redesign you’ve been contemplating and instead you might decide buying more abstract paintings for your collection is the smart thing to do. 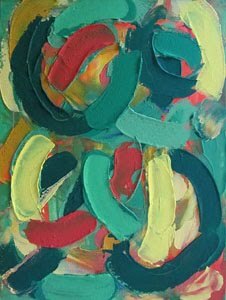 Dancing at Dusk shown above is an abstract painting in textured acrylic with shades of green, bright blue, dark red and orange. This original wall hanging measures 18" x 24". Here music playing at dusk leads to dancing. Enchanted couples dance and laugh all night long. The abstract paintings and decor items you bring into your home express what you are feeling and where your life is headed. 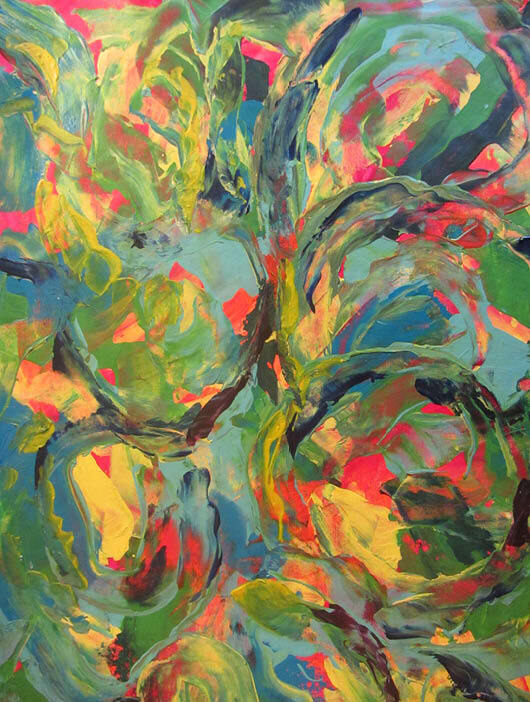 Look for abstract paintings and art that reflect that change. Choose abstract art and decor items that add depth, adventure, boldness and inspiration in your home. Next consider using abstract paintings and home decor items as a way to improve your life one art piece at a time. A room redesign is a blank canvas for all your hopes and dreams. If you can change what’s happening in your home, you can change what’s happening outside your home as well. Are you searching for more serenity, enlightenment, creativity and love in all aspects of your life. To bring a living space to life many people want to use colour, but designers will suggest staying with neutrals to better improve resale of a home. Is that a compromise to your everyday living experience? An easy solution is to add daring and colourful abstract paintings throughout your space. 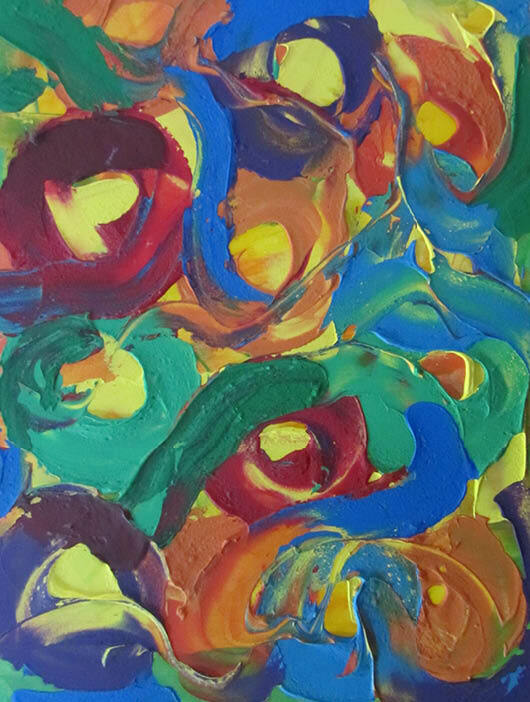 Angels Singing shown above is an abstract painting in textured acrylic in colours of bold blue, bright green, striking red, sunshine yellow and happy orange. This original wall hanging measures 18" x 24". Here children sing together harmoniously and their vibrant faces shine like angels. An abstract painter at heart, I took a long time getting to painting as a career. Instead I pursued what I thought I should be doing. I worked as a graphic designer, sometimes for some pretty big companies. In that long break from painting I wondered why I felt so uncomfortable and stressed in an office setting. 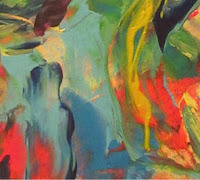 When I was younger and even into my 20s I remember painting abstract and landscape paintings. I had felt great then, so I started painting again to reduce stress. 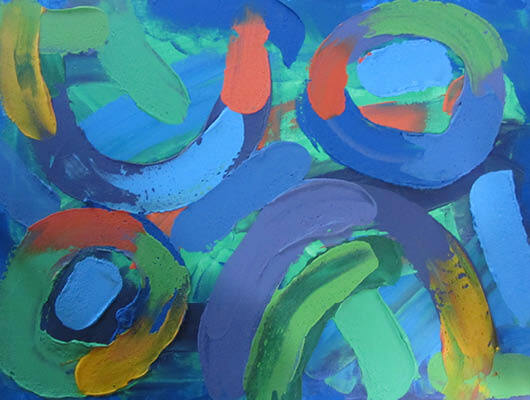 This time I naturally focused on abstracts, because I felt connected with the bold colours, thick textures and broad brush strokes of my abstract paintings. Now I tell friends to hang paintings and wall art in their offices to make it professional yet comfortable, homey and inspiring. I also think anyone can paint, so pick up a paintbrush or spatula and paint on whatever surface you find. Don’t miss out on the benefits that developing your own creativity can give you. Painting is spiritual. I like many artistic things, but I feel the most fulfilled when I’m painting abstracts in my studio. There is a meditative feeling I get from painting. I feel like I’m replenishing my soul every time I pick up a spatula and put it to canvas. Hat Feathers shown above is painted with acrylic paint in shades of blue, green, red, yellow and orange and measures 18" x 24". Here fashionable ladies chat in the park wearing gaily feathered hats. The feathers are so long they curve down and dance with each ladies’ movements. Abstract painting is healing. When I paint my spatula connects with the canvas, my arm movements go from rigid to relaxed and I release stress, anger and pain. I paint to feel good and it always works. 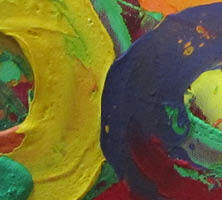 Now I want to improve everyone’s life through bold colourful abstract paintings. Some artist paint their feelings as dark angry images and it’s therapeutic for them. 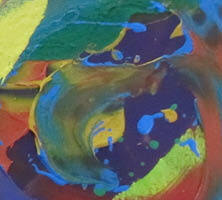 That’s not how I work, bold colourful abstract painting is my therapy. When I enter my painting studio and see all my favorite happy bold paint colours and imagine all the organic free flowing shapes I can create on canvas, my body and mind transformation already starts to take place. My finished abstract paintings don’t reflect any of my negative emotions. If your artwork and home decor items compete on an emotional level, your living space could be creating chaos within you. For instance if there is a pretty floral abstract hanging on the wall and nearby you have a throw blanket with a hunting scene depicted on it, only keep what seems uplifting and build on that. Having colourful happy paintings and pleasing decor items in your home will breathe life into your family after a long day. Your environment has a much stronger effect on you than most people realize. Never paint, buy, or hang a painting in your home that will make you feel anything but your best. 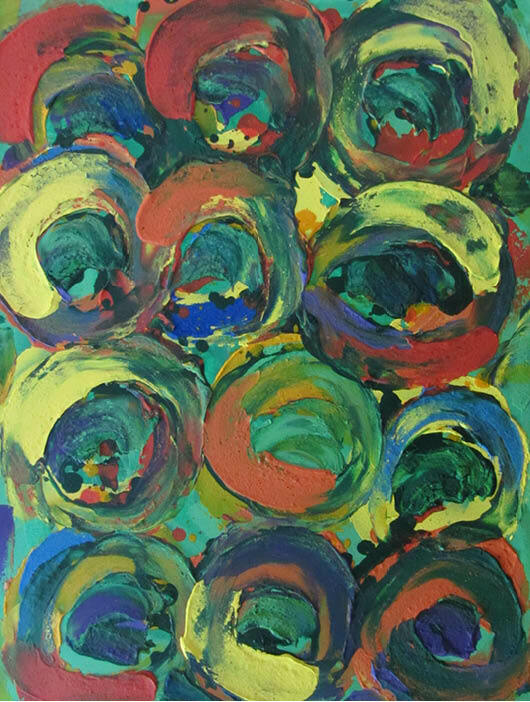 Summer Flowers in Bloom shown above is painted with acrylic paint in shades of blue, purple, green, red, yellow and orange and measures 18" x 24". Here flowers open to the welcoming heat of the sun and show off their striking colours to people passing by on an afternoon stroll. Hanging original abstract paintings in small nooks, landings and hallways provides a great opportunity to create flow from one living area to the next. Many times these spaces can be mystifying, but well placed small abstracts won’t let these often neglected areas fall flat on you. Three smaller abstract paintings hanging in a row can have the same visual impact as one larger painting and are more suited to hallways, or small cozy nooks where a larger painting would be too overwhelming. If you have a small nook or landing with high ceilings consider hanging a few colourful smaller abstracts stacked one above the other, the bright paintings will bring the viewer's eye up and provide the space with an expansive feeling. 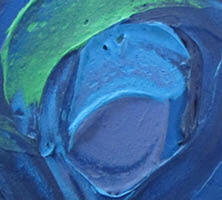 The colour and texture of the abstracts you choose can vary and the overall effect will still be unifying. While you don’t have to fill every wall with an original painting, that small surprise you see as you round the corner will be worth it and your guests will enjoy uncovering the story of you and your home through the art you've thoughtfully selected. So don’t miss an opportunity to add design and style to your home with one-of-a kind abstract paintings. Nightfall shown above is painted with acrylic paint in shades of deep blue, purple and green and measures 18" x 24". Here the wind swirls, leaves scatter and shadows form and grow as the sun sets. A magical time of day when one thing blends into the next and we see we are all truly connected. No design style or direction in your home decor? Don’t worry an abstract painting creates an instant focal point for your room and a starting point to inspire more improvements. 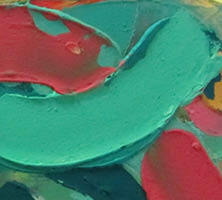 Abstract paintings created with bright bold colours are great for developing a colour palette from. With little effort and fantastic results you’ll have a selection of colours for your walls and a choice of accent colours for your room’s decor. You can also continue this colour scheme through to the rest of your home with some variation to create interest. 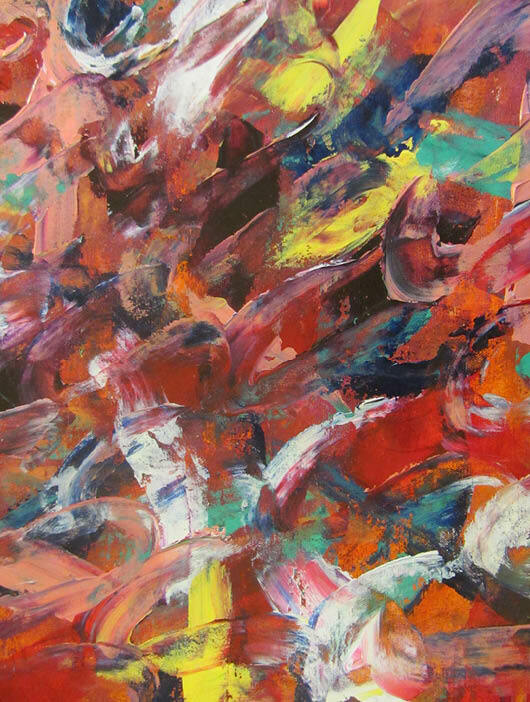 Abstracts are not just for modern and contemporary styles of furniture anymore. These paintings are great with antiques, or an eclectic mix of everything, even 10 year old beat-up furniture from your college days can look sophisticated with an abstract painting hanging nearby. And if you don’t have very much furniture, abstract paintings suit a very minimalistic approach to design as well. Which means less expense and less clutter to create a dynamic and inviting space for you and your family to enjoy. Abstract paintings can compensate for alot of home decor blunders, and on your way to a better space your abstract paintings go with you, maintaining their worth and usefulness. I am a full-time artist and I invite you to check back regularly as I often add new dramatic works of art just for your viewing. Rose Garden at Night shown above is painted with acrylic paint and measures 18" x 24". Enchanting at twilight, this rose garden’s lingering fragrance is intoxicating after the heat of the sun has left for the day and a cooling breeze settles in. Perfect for a romantic stroll. I paint for people who have a growing appreciation for their living space and want to improve it. People like myself who realize their surroundings effect how they feel. So if you’re starting a home decorating adventure, begin with the room you’re in most and pick the art first. To select an abstract painting for your home, first measure the space where you would like your painting to hang. You can even tape newspaper to the wall and block out where you want your abstract to go. When selecting an abstract painting ask yourself, do you prefer strong colours, contrast of light and dark, texture, or all of the above? When you’ve selected a few favorites then ask, what does each painting say to you, is one abstract more stimulating than the others? You can’t go wrong with picking the abstract you love most above all others. Trust your gut feelings and put that painting in your cart before someone else snaps it up. The painting Walking Arm in Arm Through Falling Leaves shown above is painted with acrylic paints in shades of green, red, orange and yellow and measures 18" x 24". Here two companions stroll arm in arm down the street enjoying the fall colours, bundled in warm sweaters, scarves and mittens. Original abstract paintings in bold dynamic colour schemes, unusual textures and all sizes are waiting to solve a variety of design dilemas for you. Is your decor issue listed below? Do you feel unfocused in your living space? Bring comfort and ease to your surroundings with a bright abstract painting as a striking focal point. Do you have worn-out furniture and a limited budget? Abstract paintings are adaptable and add sophistication and elegance to all furniture styles, yes even well-loved furniture. Maybe you feel burnt-out as soon as you arrive at the office. Bring inspiration to your workspace with a small abstract art piece and revive your flagging motivation. Office spaces are notoriously unwelcoming. No wonder you don’t want to be there. Is your view obstructed? With houses and condos being built closer together, this is a common problem. You can’t move the window, but you can bring everyone’s attention to a boldly painted canvas on the opposite wall instead. Did all your guests leave early from a recent party thrown at your home. 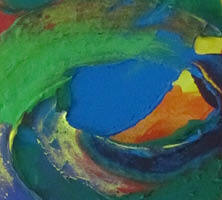 Entice your guests with mood enhancing abstract art placed around your home and create atmosphere. Your guests will find a nice comfy spot and enjoy the view and stimulating conversation for hours. The painting Misty Morning Sunrise shown above is painted with acrylic paint and measures 18" x 24". The sun’s rays are defused by the morning mist as it rises on the horizon, yet some of its bold orange and yellow colour seeps through, hinting at a perfect day ahead.